I will be one of five speakers that will discuss topics related to Gilded Age homes, society, and art. I will be giving a walking tour of the carriage trails at Olana, and talk about Frederic Church's love of music and the famous composers he was friends with. At special grand vistas overlooking the Hudson River I will perform musical duets from this time period. I will be giving a lecture as part of a week long "Roads Scholar" experience called "Historic Mansions & Significant Sites Along the Hudson River" hosted by the Warwick Conference Center. "Go back in the past to explore the tasteful but opulent grandeur of the Hudson River mansions that belonged to America’s wealthiest families of the Gilded Age. With historians and local experts, explore the grounds, houses and gardens of mansions and West Point. Journey up and down the beautiful Hudson River Valley, and learn the story of these families and relive the culture of the Gilded Age with artful instruction by local experts." I will be premiering Peter Cody's virtuosic quartet for alto saxophone, trumpet (Jim Osborn), clarinet (Larry Tietze), and Cynthia Peterson (piano). Other works on the program include Summer Music for Woodwind Quintet by the renowned American composer, Samuel Barber. In a concert featuring saxophonist Christopher Brellochs, head of the Dutchess Community College Music Department, and pianist Cynthia Peterson, this program features "Music of the Gilded Age in the Hudson Valley." This will include music from early American and French composers who's own stories also relate back to the history of the Hudson Valley during the 19th century. FREE Admission and meet-the-artists reception after the concert. During the Gilded Age (1860-1900) people wanted the best from Europe, but with an American sensibility. For this musical program, that means some of the finest French music from the Paris Conservatory, an 1879 composition by English immigrant Caryl Florio for saxophone, and piano pieces by American composers Louis Moreau Gottschalk and Ulysses J. Alsdorf. This performance is part of a sabbatical project by Dutchess Community College professor Dr. Christopher Brellochs, where he researches the music and stories of the Gilded Age. I am playing lead tenor saxophone with the Northern Dutchess Symphony Orchestra, and love is in the air with popular love songs from The Great American Songbook including music from Cole Porter and George Gershwin. The second half of the program will feature the cabaret stylings of Broadway actors Erin Stewart and David DeWitt. Hear some jazz standards in this historic inn; the band has its own nook so you can sit at tables in the bar area and still have a conversation. Experience a Gilded Age holiday party at a Gothic revival country estate. Enjoy some light refreshments before exploring the beautiful first and second floor at your own pace, glass of wine in hand, and then join us in the parlor to hear a live performance of exquisite late 19th century music composed to be heard in the music rooms of the time. It is easy to attend for as little as $50 for two entries to the party by becoming a member of Lyndhurst. The best way to purchase a membership is online at the following link: https://lyndhurst.secure.force.com/donate/?dfId=a0n41000007ZVMVAA4. Although you can join on the day-of, by becoming a member in advance you will receive an invitation in November and can RSVP for the concert. Members in the higher levels may request additional RSVPs which can be accommodated in advance. BE IMMERSED! Imagine the brisk December air invigorating you as you walk on the 67-acre park of the estate beforehand, then entering a building designed by a leading architect of the 19th century, being surrounded by expertly curated interiors highlighting the finest decorative arts of the period - and finally, as the culmination of the experience, hearing exquisite music that was created for this space. Now you can experience what was accessible only to the very wealthy 130 years ago. Jazz quartet with Larry Ham (keyboard), Chuck Jacob (bass), and Andrew Rieser (drums). EUROPE, HERE I COME! I'm excited to be giving a lecture-recital in Zagreb, Croatia this summer at the XVIII World Saxophone Congress, July 10-14. I will be traveling before and after so please send recommendations on people, places, or things I should see in that area of the world! My proposal was accepted on "Gilded Age America (1870-1900): Caryl Florio and the Vanderbilts" where I will discuss the 19th century saxophone compositions of Caryl Florio and their place in the larger social fabric of the United States. Step back in time as you walk the beautiful grounds of Boscobel House & Gardens with an ice cream in hand and the sound of a 19th century saxophone quartet drifting through the valley. Come hear delightful music composed by Caryl Florio and J.B. Singelee before anyone even imagined jazz. Saturday, June 16, 2018 \ 7:30 p.m.
236 East 31st Street, betw. 2nd and 3rd Ave. I'm playing tenor saxophone on Virgil Thompson's "The Plow That Broke the Plains" in a FREE concert with The Orchestra Now in NYC tonight and Hudson, NY on Sunday. I'll be the civilian playing alto saxophone on Percy Grainger's "Lincolnshire Posy." I'll be playing tenor saxophone with The Orchestra Now at Bard. Coincidentally I am conducting a suite from Gershwin's "An American in Paris" with the Mid-Hudson Community Orchestra this semester! Come out to experience the Hudson Valley’s newest jazz collective: the Main Street Jazz Quartet! On Sunday, January 28, 5:00-7:30 pm, MSJQ brings vintage swinging standards to a vintage venue, the Beekman Arms Tavern in beautiful downtown Rhinebeck. MSJQ is a collaboration of DCC music professors Christopher Brellochs (sax) and Larry Ham (piano), along with Chuck Jacob on double bass and Andrew Rieser on drums. Join us--hope to see you there! It is always great to play some jazz for Oakwood Friends! 11 saxophonists play great holiday selections! Wagner, Grand March from "Tannhauser"
Tchaikovsky, "Sleigh Ride," November from "The Seasons"
Mendelssohn, Nocturne from "A Midsummer Night's Dream"
I will be directing the college jazz ensemble! I am so excited for my debut as conductor of the Mid Hudson Community Orchestra, and there is no better event than bringing live music to people who are no longer able to attend public music events! That's one reason why The Manor at Woodside is considered an all-inclusive independent senior living option - live orchestral music included! I'll be directing the Dutchess Community College Jazz Ensemble as we open for the Poughkeepsie Jazz Project. My saxophone will be ready for the jam session that follows our opening set! "Join us Friday, October 20th at 8:00 pm for our Fred Astaire Friday Party on location at Shadows on the Hudson. We have a live band coming to kick off the season! Group class to kick off the night, followed by general dancing! Come celebrate an evening of dinner and dancing at one of our favorite hot spots." Rabbit & Turtle is a friendly new meeting and dining destination in the heart of downtown Poughkeepsie. Located within walking distance of the Bardavon, the Mid-Hudson Civic Center, Poughkeepsie Grand Hotel and The Chance Theater. Read the recent Poughkeepsie Journal article about the Rabbit & Turtle! Celebrating 6 Strings, Singers & Sax, Plus Piano! This will be an evening featuring virtuoso acoustic guitar performance combining forces with singing, saxophone and piano - International Fingerstyle Guitar Champions Helen Avakian & Mark Sganga, internationally performing saxophonist Christopher Brellochs, music director/vocalist Elizabeth Gerbi and guitarist, Dave Irwin who has performed on ESPN. We will be performing separately and in various groupings together. Music of Carole King, Joni Mitchell, Ralph Towner, Brazilian, Celtic and Originals. We will also play a couple songs with some special guests who are former or current students of ours! If you are a former or current student and wish to join our ensemble, send me an email ASAP and I will be happy to provide further information. There will be a benefit component to the evening; our beneficiary will be MusicLink Foundation, a national organization providing music lesson scholarships to children in low income families. All proceeds will go to the Dutchess Community College Music School MusicLink so it will stay right here in the community. We will be holding a raffle with items like a guitar, a ukulele, recordings, and gift certificates. Separate voluntary donations may also be made. $15 advance $20 at the door. Reservations recommended and appreciated. Please feel free to post, forward and share. It helps us a lot. Thank you so much! Dinner available (praised by NY Times), as well as renowned desserts. Thank you to our generous sponsors: Jacob's Music Center, Jake's Main Street Music, Darkside Records, Guitar Center Middleton. Saturday, April 22 at 8:00 p.m.
Geoff Vidal and Derek James from West Point will be giving an improv clinic. There will be vendors (aiming for all MAJOR brand names) - and college representatives. The location of this event is at Arlington High School. The Date will be Saturday December 17th (snow day on the 18th). The concert will start at 6pm with an intermission. The first half will be dedicated to performing Bob Shaut's "Valley Views and Bridges" in it's entirety - complete with his "Sax Life" group and other solo type mvts. Paul Cohen will be conducting the first half. After intermission, Bill Stevens will conduct. This half will be our beloved Xmas concert with a twist. We will start with the HVSO alone playing the Martino-Type Arrangements. After that we will invite the "Wonderland" Participants (who attended an earlier rehearsal) onstage to complete the concert as a GRAND orchestra of as many as we can get. Paul Effman Music is sponsoring this once again this year, but we need a few more sponsors (please contact me at cb@christopherbrellochs.com to help). Hopefully this lineup will draw us a HUGE crowd. DCC Jazz Ensemble directed by Dr. Christopher Brellochs and DCC Guitar Ensemble directed by Steve Raleigh perform! Dutchess Hall, James & Betty Hall Theatre. Reception to follow. Music by Adolphe Sax, and Gilbert & Sullivan, as well as the songs of Jerome Kern. Vocalist Elizabeth Gerbi, saxophonist Christopher Brellochs, and pianist Cynthia Peterson. Reception to follow. Dutchess Hall, James & Betty Hall Theatre. Reception to follow. Dutchess Community College JAZZ ENSEMBLE SUMMER PERFORMANCE! I'm getting the band back together!! Sambas, Bossas and Classic Jazz! The DCC Jazz Ensemble directed by Dr. Christopher Brellochs will perform! April is Jazz Appreciation Month so the Poughkeepsie Jazz Project has invited the Dutchess Community College Jazz Ensemble to be their opening act. This is 15 piece big band with two featured vocalists all of which are students at the college! Director Christopher Brellochs will be joining the house band after the opening set and before they open up the jam session! I'm playing with Crazy Feet Pete for a wonderful dance party with instructor Joe Donato! This dance has a beautiful wood floor and is a great place to practice whatever you are learning: Balboa, Lindy Hop, East Coast Swing. Ask someone to show you how to do a move; bring your friends. No Partner Needed! No Experience Necessary! I'm looking forward to performing with jazz pianist Peter Tomlinson for this event! I will be guest soloist with the Aerophone Community Band under the baton of Rich Holod, performing Bernhard Heiden's "Diversion" for Alto Saxophone and Band. Written in 1943, this majestic piece takes listeners on an emotional journey that includes elegance, struggle, and triumph. I will perform an improvised cadenza which means it will be unlike anything you've heard before! If you are familiar with Eugene Rousseau's well known recording, this means I intend this performance to be even more dazzling and exciting! We will perform at 4pm in Armstrong Concert Hall! A Tribute to the Rascher Saxophone Ensemble, and Beyond! Hudson Valley Saxophone Orchestra - Dr. Paul Cohen, Guest Conductor / Lecturer. This program would be an hour lecture /recital highlighting the history and legacy of the Rascher Saxophone Ensemble and how it led to the modern day ensemble so prevalent today. The presentation would include performances of original and transcribed works from the library of the Rascher ensemble, arrangements and original works written for subsequent groups that formed due to the pioneering aspects of the Rascher group, and concluding with a world premiere of a new work written for the Hudson Valley Saxophone Orchestra. I look forward to performing with pianist Cynthia Peterson and singer Elizabeth Gerbi to benefit with fine orchestra. The DCC Guitar Consort directed by Steve Raleigh and DCC Jazz Ensemble directed by Dr. Christopher Brellochs perform! Area college Jazz Ensembles perform for a holiday concert. The Dutchess Community College Jazz Ensemble under the direction of Dr. Christopher Brellochs will be there! Playing jazz with Susie Deane! Playing jazz with Pete Redmond. Come hear the Dutchess Community College Jazz Ensemble under the direction of Dr. Christopher Brellochs. Jam session afterwards! The Dutchess Community College Jazz Ensemble is comprised of music majors, non-majors, high school students and members of the community. The group performs concerts and events at DCC, as well as throughout the community. Community performances have included the Dutchess County Jazz Festival, the Mid-Hudson Civic Center and The Derby with the Poughkeepsie Jazz Project. The group rehearses Tuesday evenings and students can earn college credit. Alumni of the DCC Jazz Ensemble have transferred as music majors to prestigious colleges such as Ithaca College, SUNY Potsdam Crane School of Music, SUNY Fredonia, SUNY New Paltz, SUNY Purchase, The New School, Western Connecticut State University, College of Saint Rose and William Paterson. The DCC Jazz Ensemble is directed by Dr. Christopher Brellochs, who is also chair of the music program. 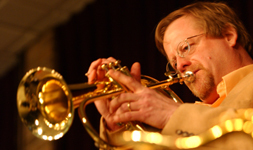 In addition to being an educator, Dr. Brellochs is an accomplished saxophonist and composer whose recordings have been heard on National Public Radio. He recently returned from a tour which took him to Paris and Strasbourg, France where he performed at Selmer House, Vandoren and The Word Saxophone Congress. DCC offers courses in all styles of music including contemporary/pop, musical theatre, jazz and classical and are open to music and non-music majors. The college also offers an Associates in Performing (Music Advisement Track) and Music Performance Certificate. Students may take private lessons for college credit, and participate in large groups including the Jazz Ensemble, Chorus, Show Choir, Guitar Ensemble, and Orchestra. For more information contact Dr. Christopher Brellochs at christopher.brelloc@sunydutchess.edu. Very excited to perform at the place that made the instrument I play! I will be providing comments to student saxophonists for their exams. I am playing saxophone for swing dancers! I'll be playing on three pieces with the orchestra, with a really nice solo on "Times Square Ballet". This year’s theme is LOUD and PROUD! Bring any kind of instruments or noisemakers and let yourself be heard! I'll be playing saxophone with Crazy Feet as we are pulled on a flatbed along the parade route to the waterfront! The DCMEA-Dutchess County Music Educators Association, along with the Arlington Band Boosters, Inc and the Arlington High School Music Department, are proud to present the Dutchess County Jazz Festival! The festival will be held in the William J. Sweeney Performance Hall at Arlington High School on Saturday, May 2, 2015 beginning at 12noon. Admission is FREE! Christopher Brellochs will be directing the All-County Jazz Ensemble & Dutchess Community College Jazz Ensemble! Subbing with https://www.facebook.com/NewYorkSwingExchange and playing Big Band music! -Jazz in the Valley c/o Transart, Inc.
is a group that hosts a weekly Jazz Jam Session in Poughkeepsie NY. Founding members John Scanlon and Ben Basile started the project in October 2012. The jam session has been running weekly for over 2 years now and has become an established part of the local Jazz community. The group released their debut album in November 2014.
was established in 2000 when TRANSART, Inc. received a grant from the New York State Council on the Arts to commission jazz great Ahmad Jamal to compose a piece in homage to the Hudson River Valley. The presentation of this piece, entitled "Picture Perfect," was the beginning of an end-of-summer event for jazz lovers seeking a change of scenery. The event was also an opportunity for local residents to experience jazz. The program has since grown into an annual concert series showcasing music performed by world-class musicians fittingly complemented by breathtaking views of the Hudson River as backdrop. I will be a guest jazz ensemble conductor this weekend! The Monticello Central School District will serve as the host for the 2015 Sullivan County Music Educators’ Association All County Music Festival. The festival takes place over two days, culminating in two concert performances on Saturday, March 7, 2015. More than 500 top young musicians in grades 4-12 from eight Sullivan County school districts have been selected to participate in this year’s festival. Students will work with notable guest conductors from throughout the United States on Friday, March 6 and during the day on Saturday, March 7, 2015. Concert I – 2:30 PM – Jr. High School String Orchestra, Elementary Chorus and Middle School Band. Concert II – 5:00 PM – Sr. High Jazz Ensemble, Sr. High Women’s Chorus, Sr. High Mixed Chorus and Jr. High Band. Both concerts will take place in the Monticello High School Arnold Packer Hughs Auditorium, 39 Breakey Avenue, Monticello, New York. Tickets are priced at $6. For more information or questions, please contact Andrew Verdino or Michael Mingo, Festival Chairpersons at (845) 794-8840 ext. 10853. The spirit of cultural exchange brings French saxophonists Nicolas Prost and Anne Lecapelain to the United States in February 2015 for a series of concerts and masterclasses, including collaborations with American saxophonist Christopher Brellochs; this French-American musical exchange continues in the summer as Christopher travels to France to partner with Nicolas and Anne. The program in the United States will feature French composers including Debussy, Ibert and Milhaud. French saxophonist, Nicolas Prost has been a soloist with the famous Concerts Lamoureux Orchestra in Paris, chamber musician member with the Variance Ensemble and the Saxiana Trio, and appeared as a solo performer with the Philarmonic orchestras of Mexico, Thailand, Suisse-Romande, OP de Strasbourg, Capitole de Toulouse, E.C.Montreal and European Camerata of London. Being very interested in the development of saxophone literature, Nicolas has written numerous works on pedagogy published by Billaudot, Lemoine, Fuzeau etc., contributed to the book "saxophone à la francaise", made numerous recordings receiving positive international reviews, and presented world première performances of more than 80 new pieces dedicated to him from composers such as Hersant, Escaich, Pecou, Bacri, Zavaro, Lauba, Naon and Beytelman. Nicolas Prost won first prizes in 1994 in performance and chamber music at the Conservatoire National Supérieur de Musique in Paris and several chamber music international competitions. He was named Lauréate of the Yahama Foundation and teaches at Saint-Maur Conservatoire close to Paris and gives conferences and masterclasses in elite French conservatories such as CNSM Paris and international universities in Seoul, Tokyo, Mexico, Amsterdam, Prague, Cologne, Barcelona, Fribourg, Riga and Bloomington. French saxophonist Anne Lecapelain won the 1st Prize of the Conservatoire National Superieur de Musique of Paris in 2000 and earned the Complete Diplôme with higher distinction in 2001. Prize-winner of the international competition in Limoges in 2001 and the City of Paris in 1995, she dedicates herself to chamber music, and has performed in famous venues throughout France including the Auditorium St Germain, Arsenal de Metz, Cigale de Paris and in Strasbourg. She gives numerous chamber music recitals in Ile-de-France but also in Turkey, Spain, Netherlands, Canada, South Korea, Japan, Mexico, Bangkok and Anglo-Normande Islands. She is very interested in the music of 20th century, impressionism, neo-classic and popular styles, she regularly engages in the transcription of romantic or baroque works. She is invited for solos with the Orchestra of Concerts Lamoureux in Paris, National orchestra of Pays de la Loire and to the Suisse-Romande Orchestra and accompanies Pop artists at the Olympia of Paris. She also collaborates in numerous small venues with poets and comedians. A graduate of CNSM of Lyon for the Certificat d’aptitude, she teaches saxophone at the Conservatoire of Saint-Germain-en-Laye and is a co-author of an educational exercise book published by Lemoine edition. Her discography " Music à la carte (Atout sax)", "Bolero (Erato)", "Nachtgesang (Trio Saxiana)" has received positive musical critiques. Her last CD with the Trio Saxiana (Creations 2011) is dedicated to new works of French composers of international fame: Thierry Escaich, Thierry Pécou, Christian Lauba, Nicolas Bacri. I am excited to perform with jazz piano extraordinaire Larry Ham. Please come join us for what is quickly becoming a "Hudson Valley Tradition". Fresh musical renditions of timeless Christmas Classics performed by 11 of the Hudson Valley's finest Saxophonists. Proceeds are used to support LOCAL music scholarships! Please join us and also consider checking out our new Christmas CD - "It's That Time Again" - available for $10 at the concert! There is no better time to buy some gifts at the Poughkeepsie Galleria Mall than Sunday, December 14 between 11am and 2pm. Hot off a recording session for their first CD, the Hudson Valley Saxophone Orchestra will be performing holiday favorites near JcPenney. Where else can you hear 11 saxophones play "I Saw Mommy Kissing Santa Klaus"? You know Dr. Seuss would love to experience the rumbling bass saxophone and tubax battling the soaring soprano saxophones! Come hear our complete concert with even more selections on Sunday, December 21, 1pm or 3:30pm (see this page for event). Description: When world-renowned musicians create an ensemble for which there is little established repertoire, what are the options for creating music and opportunities to perform it? Biographies: The QUIET CITY CHAMBER ENSEMBLE was founded by Christopher Brellochs in 2010 to record the world premiere of Aaron Copland’s Quiet City in its original instrumentation. Brellochs had crafted a concert version of Quiet City using the unpublished manuscript of the incidental music, which included material that had languished in obscurity for over 70 years. The Aaron Copland Estate and Copland’s publisher, Boosey and Hawkes, embraced this newly reconstructed chamber version and granted Dr. Brellochs the exclusive right to make the world premiere recording. This led to a search for other unrecorded works by American composers and the formation of this ensemble. The recording Quiet City (Sono Luminus, June 2011) has been well received, garnering significant national radio play along with interviews by Fred Child on APR (American Public Media): PERFORMANCE TODAY, the most-listened-to classical music radio show in America with 1.3 million listeners weekly, and NPR (National Public Radio): WEEKEND EDITION. The recording also received rave reviews both here and abroad, including an article in DER SPIEGEL Online, a German news magazine and one of Europe's largest publications of its kind, with a weekly circulation of more than one million! The ensemble has gone on to perform publicly, using repertoire from the CD and encouraging composers to write for this unique and wonderful instrumentation. In their 2014-2015 season they present music by Grammy® winning composer Carlos Franzetti, graduate composition student Peter Cody, and winners from their first "Call for Scores." Members of The Quiet City Chamber Ensemble are Christopher Brellochs, alto saxophone; Donald Batchelder, trumpet; Mitchell Kriegler, clarinet/bass clarinet; and Allison Brewster Franzetti, piano. I was a guest artist on the new CD released by the Poughkeepsie Jazz Project. We'll be performing the album live this evening! Swing dance with Crazy Feet Pete and his six piece ensemble! I will be playing soprano saxophone on Paul Winter's "Earth Mass" along with a piece for saxophone and organ. I will be performing a few pieces alongside my colleagues at Dutchess Community College. I'll be playing bari sax with In the Pocket. "In The Pocket is the Hudson Valley's top rock & soul cover band. How do we know this? Well, you could talk to the fans who keep going to see them, the venues that keep having them back, or the couples who have had them as part of their wedding. Or you could simply look at the fact that they were recently voted "Best Local Musician" in Hudson Valley Magazine's Best of Hudson Valley 2013 contest." I get to play soprano saxophone like Sidney Bechet in this New Orleans/Dixieland-style parade band The Saints of Swing! This year marks the 26th annual concert at Bolton for Matt Finley & Rio JAZZ, the Hudson Valley's premier Brazilian jazz concert band. Jazz saxophone with pianist Larry Ham. Guest judge for Dutchess County Jazz Festival hosted by Arlington High School and Rich Guillen. This year marks the 27th annual concert at DCC for Matt Finley & Rio JAZZ, the Hudson Valley's premier Brazilian jazz concert band. Don't miss this great night of jazz in Poughkeepsie with some of the world's best jazz performers. Sponsored by DCC Student Activities, (845) 431-8050 "Our favorite event of the year" - Mike Weida, Director. ● Free refreshments will be served. ● Free admission! This is a featured event for the Smithsonian's Jazz Appreciation Month in April. Visit the RIO Jazz website HERE! Elizabeth Gerbi will be singing an entire one-woman musical theatre show in this Northeast performance before performing it Saturday, April 5 at Shenandoah Univeristy in Winchester, VA. She will be accompanied by Christopher Brellochs (saxophone) and Ann Foster (piano). The event will be held in Dutchess Hall, Dutchess East Lounge (D202) at Dutchess Community College. Alumni Theater 120 Bloomfield Ave. The Quiet City Chamber Ensemble will be performing on a program with other wonderful chamber ensembles. We will play Aaron Copland's "QUIET CITY" and a Scott Joplin rag (arranged for trumpet, alto saxophone, bass clarinet and piano)! Bandleader and bass player Ben Basile provides some sweet jazz for Valentine's Day. I am honored to be the guest artist for the 2014 Liberty Jazz Festival which will include area middle and high school jazz ensembles! Join us for the first Fifth Friday Dance of 2014! Crazy Feet is a hot swing dance band from Poughkeepsie, NY. All the band members have been playing various types of music for decades. The evening will be a mix of east coast swing, west coast swing, blues, Motown and good old rockin blues. Joining us are: Pete Redmond on guitar and vocals, Robert Bard on bass, Mario Hernandez on trumpet, Chris Brellochs on tenor sax, John Scanlon on keyboards and Andrew Greeny on drums. Dance lesson by Julie and Joe Donato. Click here to visit their web-site. Click here to visit Crazy Feet’s web-site. Jazz duo of Christopher Brellochs (saxophone) and Larry Ham (piano). Click on the image below to go to the Facebook page for the Hudson Valley Saxophone Orchestra; enjoy photos and audio clips, and please "LIKE" us! Private house party for The Chappaqua Orchestra. Performing "Scaramouche" by Darius Milhaud with Cynthia Peterson on piano. Hear a great variety of styles, instruments and vocalists as the lesson faculty at DCC demonstrate their artistry! Singer/Songwriter Steve Schultz (Think Ben Folds meets Bruce Springsteen) with lots of sax solos! Hear the rich sounds of a saxophone trio outdoors! Music of Mozart*, Dvorak, Debussy, Milhaud and Ibert. All arrangements by Christopher Brellochs except where indicated (*). Think Ben Folds meets Bruce Springsteen. I will be performing Paul Bonneau's "Caprice en forme de valse" at the annual Sing-a-Thon/Play-a-Thon hosted by the Music School at Dutchess Community College in the James and Betty Hall Theatre. Set to open the show is the D’amby Project, an Irish step-dance group. The event – at which DCC students, faculty and community members perform – benefits the MusicLink Scholarship Fund, which provides free or low-cost music lessons to local students who otherwise could not afford them. While attendance is free, donations to MusicLink will gladly be accepted at the door. Rio JAZZ will be performing their 25th anniversary concert for Bolton Landing's summer outdoor concert series in Roger's Park on beautiful Lake George, NY. Bring lawn seating. Weather should be great, but if it isn't, performence is inside the Town Hall. For more info, call the Bolton Chamber of Commerce at (518) 644-3831. Featuring Peter Tomlinson (piano), Jeff Ciampa (guitar), Don Miller (bass), Richie Morales (drums), Chris Brellochs (sax) & Matt Finley (flugelhorn/trumpet/sax/flute). I will be performing George Gershwin's "An American in Paris" in this orchestra in the park concert! Concert pianist Cynthia Peterson performs again at the Winery. She will be joined by colleagues in a delightful program of instrumental and vocal music ranging from beloved classics to favorite moderns. I play alto, tenor and bar sax on this gig! Brazilian jazz concert - free with free refreshments. Drumlin Hall. A collaboration with visual artist Gregory Brellochs, my brother, who was part of a three person exhibition at the Perkins Center for the Arts in Collingswood, New Jersey (just outside of Philadelphia). I will be performing music to accompany selected art works. On Saturday, April 14 at 3 pm, saxophonist and composer Christopher Brellochs and the QUIET CITY CHAMBER ENSEMBLE present a discussion and performance celebrating the impact of New York City on the art of music. The performance, at Dutchess Community College, Dutchess Hall, Ritz Lounge, 53 Pendell Road, Poughkeepsie, New York, features Brellochs' new adaptation of Aaron Copland's Quiet City. Originally written in 1939, this piece was incidental music to a play set in New York City by playwright Irwin Shaw. Although Quiet City was adapted in 1940 and became an orchestral favorite, the original manuscript was largely forgotten until recently rediscovered by Brellochs. He adapted the score, using the original instrumentation and restoring musical themes that hadn't been heard in over 70 years. At this performance, Brellochs and his colleagues will discuss historical and personal connections to New York and this music. Also performing are GRAMMY-nominated pianist Allison Brewster Franzetti, New York City Opera principal trumpet Donald Batchelder, and clarinetist Mitchell Kriegler. The program features selections from the new CD Quiet City (Sono Luminus DSL-92135). The recording features American music by Aaron Copland, Leo Ornstein, Robert Aldridge, and Seymour Barab. Reception: There will be a reception during the pre-concert discussion. ***The campus Art Gallery opens at 10am and will have an exhibit on New York and there will be a lecture at 1:30pm. On 10/16/11 The New York Times reviewed a recent concert by Copland House and included a preview of an upcoming performance in which I will perform my restored chamber version of "Quiet City"! Playing 2nd set with: Matt Finley, tpt, sax, flute; Peter Tomlinson, piano; Jeff Ciampa, guitar; Don Miller, bass; Joel Rosenblatt, drums; Tomas Martin Lopez, Latin percussionist. Christopher Brellochs - saxophone Brandon Nelson - bass Andy Polay - drums The patio is open and the AC is great inside. Either way, you'll get healthy portions of great dinner and/or experience their full, friendly bar. So come, have some great food, watch the river, and listen to great jazz! Reservations suggested. Featuring Christopher Brellochs on saxophone. 23rd Anniversary Concert of Matt Finley and Rio Jazz with guest artist Christopher Brellochs. Recording Michael Torke "Grand Central Station", Matthew Tommasini "Torn Canvases", and Vincent Persichetti "Serenade for Band"
Welcome your weekend with renditions from Monk, Miles, Herbie, Shorter, Coltrane and more.